New models, improved battery life, and Oregon’s expanding network of electric vehicle chargers is making it easier than ever to go electric – and make sure you’re still road trip-ready. Oregon-based Chargeway is making it even easier. Rather than trying to decipher if your car needs a CHAdeMO, Combo charger, or something else, Chargeway has developed a simple color- and number-coded system to get you on the road faster. 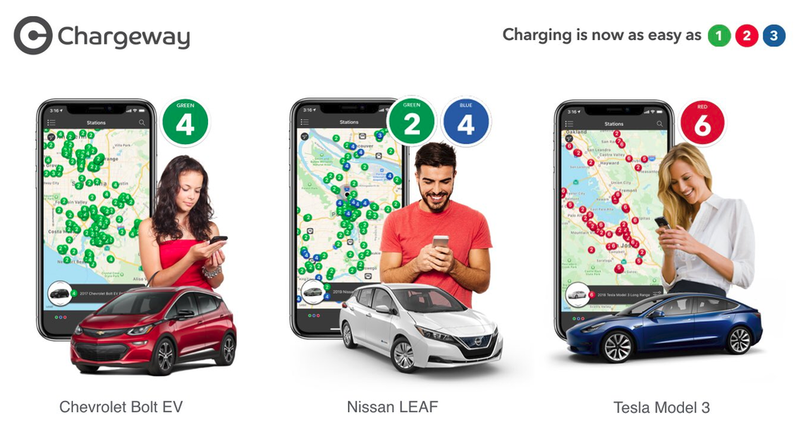 Download Chargeway’s free app, enter your exact vehicle, and the tool will tell you which chargers work for your car: blue, green, and/or red. Corresponding numbers, 1-7, show you how fast you can charge… the higher the number, the faster the charge. In addition to showing where compatible chargers are located near you, you can plot out a specific road trip and Chargeway will show you the best route to reach your destination, and where and how often you’ll need to stop to charge. Not to mention: they’ll point out nearby amenities so you can grab a snack or get a good night’s sleep while you plug in. The app will also tell you what company owns the charger, and whether you’ll need a membership or can pay by credit card. Next up for the company? Building relationships with utilities and car dealerships to install Chargeway “beacons” in the dealers. The large, stand-up beacons offer bigger, interactive versions of the app so customers and sales people can walk through how the new car they’re considering will work for them. 2019 is shaping up to be a great year for electric vehicles. Learn about the incentives that can save you thousands.